Social media is changing the way that scientists are interacting with each other and with the global community. One example is the way that researchers use Twitter to increase the impact of their research. David Shiffman, a Ph.D. student at the University of Miami's Abess Center for Ecosystem Science and Policy, describes the advantages of tweeting during the development of scientific publications. 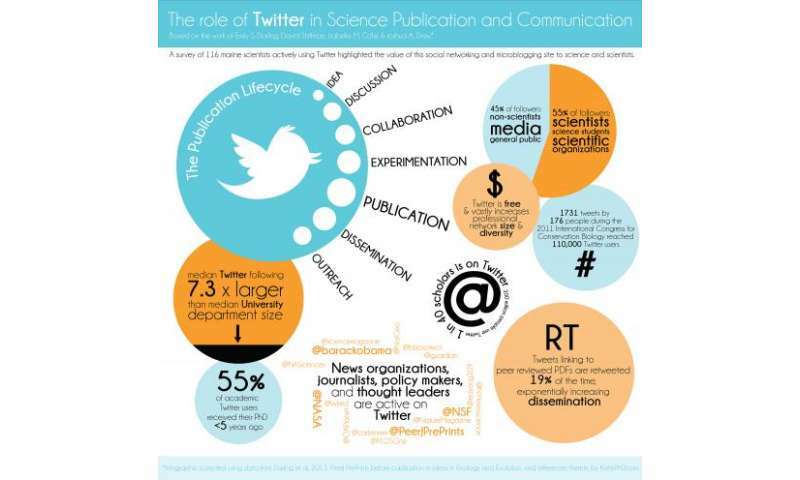 Incorporating Twitter into the different stages of a scientific publication allows scientists to connect more quickly, facilitates interdisciplinary collaboration and makes it possible to communicate results to a large and diverse audience, according to Shiffman. It also encourages post-publication conversations about the findings. "Social media, which allows information to be shared instantly around the world, gives internet-savvy scientists the ability to drastically accelerate the pace of scientific communication and collaboration," says Shiffman, who was recently named one of the top biologists to follow on Twitter (@WhySharksMatter) by the Huffington Post. Although some scientists have mixed feelings about using Twitter for scholarly purposes, it's only a matter of time before the scientific community embraces social media, says another author of the study, Emily Darling, a Smith Conservation Research Fellow at the University of North Carolina. "Many scientists may think they don't have time for Twitter," says Darling, "But a little effort can provide enormous value for communication and outreach. The solution is to just give it a try." Shiffman and his collaborators document examples that support the scientific and scholarly use of tweeting, in a study titled "The role of Twitter in the life cycle of a scientific publication," published in the journal Ideas in Ecology and Evolution.